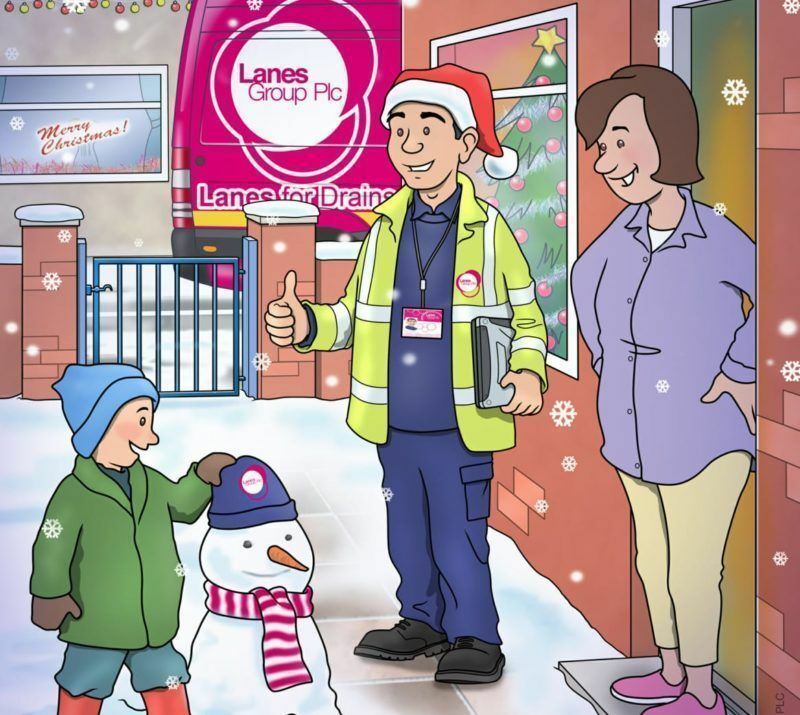 Lanes for Drains saves Christmas! Kim Ulmer and her family say they have their local Lanes for Drains depot to thank for saving their Christmas. The family lives close to the Lanes for Drains St Neots depot, in Eaton Socon, which provides drain blockage and drain repair services across the East Anglia region. A week before Christmas, the water in their washing machine suddenly started to back up – a problem they traced to a blockage in their waste water drain. Kim spoke to Tom Grove, the Area Development Manager at our St Neots depot in Cambridgeshire. He arranged for an engineer to go round to investigate the problem the same day. Kim said: “The engineer carried out a thorough examination and tried a number of methods to clear the blockage. He concluded that the drain had collapsed and was very apologetic in saying he couldn’t fix it there and then. Kim says she was desperate for the repair to be done. Otherwise she, her elderly mother, who lives with her, and her son, who was returning from university, would have had to spend Christmas in a hotel. Their plans to celebrate the festive holiday at home with family and friends would be in ruins. She said: “I called Tom at Lanes for Drains again and he changed jobs round and arranged for a crew to start early so the repair could be done that week, on Friday morning – four days before Christmas Day. “By midday, the blockage was cleared, the drain was repaired and everything was working perfectly. I can’t thank Tom and the rest of the team at Lanes for Drains enough. Lanes for Drains St Neots provides a comprehensive specialist drainage service to homeowners, businesses and public organisations in East Anglia – including drain unblocking, drain repairs, drain surveys and drainage rehabilitation using the latest relining technology. Tom Grove said: “The problem was, a drainage gully had collapsed, but it was in a blind connection – a drain connected at right angles to the nearest manhole – so it was difficult to reach. “Lanes for Drains St Neots has a permanent drainage excavation team, which not all drainage companies have. So we were able to excavate the gully, clear the pipe blockage and put in a new gully.